The name of Northern Ireland's second city is to remain Londonderry, a High Court judge has ruled. Mr Justice Weatherup made the decision after a judicial review on the issue brought by Derry City Council. 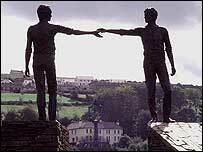 The council had wanted the government to accept its view that the name of the city is Derry rather than Londonderry. The judge ruled that just because the council had changed its title to Derry, this did not mean the name specified back in the 17th century was changed. He said only legislation or Royal prerogative could change the city's name. A spokesman for the city council said the judgement provided important clarity on the legal name of the city. Sinn Fein councillor Kevin Campbell said they would continue the fight to get the name changed. "Everybody, and I mean everybody, would benefit from it at the end of the day," he said. But Democratic Unionist councillor Gregory Campbell said this should "put the issue to rest". "For 23 years, it has made us the subject not only of division but of derision," he said. The SDLP's Pat Ramsey said the ruling clarified the legal processes involved in acquiring any possible name change. "We do, however, understand that this is a sensitive issue and we will be seeking urgent meetings with other parties represented on the council to see if there is a way to move this issue forward," he said. Londonderry was established in a Royal Charter granted by King James I in 1613. In 1984 the name of the nationalist-controlled council was changed from Londonderry to Derry, but the city itself continues to be officially known as Londonderry. Titles like 'maiden city', (despite a siege its defences were never breached) 'Foyle', (after the river which runs through it) and 'stroke city', (from Derry/Londonderry) have all been used by people trying to avoid controversy. The name Derry is an Anglicisation of the original Gaelic name of the city, Doire, meaning oak grove. The London prefix was added in 1613 when the city was granted a Royal Charter by King James I to reflect the association with the City of London and in particular The Honourable The Irish Society which had been granted lands in and around the city.